Pictured above: ICC hosted a signing ceremony on April 3 at the East Peoria Campus to commemorate an agreement to ease the transfer for students earning an associate degree from ICC and pursuing their bachelor’s degree at Bradley. 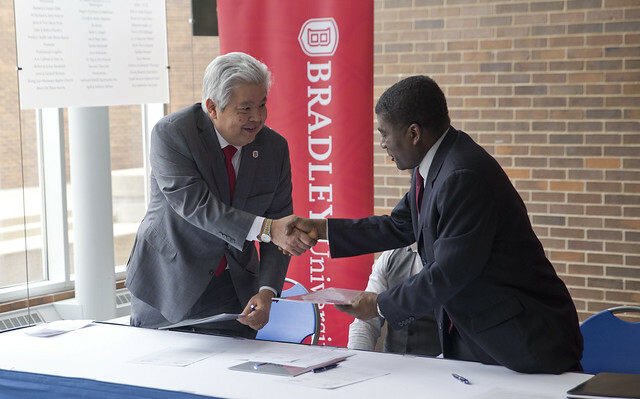 Dr. Walter R. Zakahi (Left), Provost and Senior Vice President for Academic Affairs at Bradley University, and Dr. Emmanuel Awuah (Right), Vice President of Academic Affairs at ICC, signed the agreements on behalf of the institutions. Illinois Central College and Bradley University are teaming up to help students gain their baccalaureate degrees. Through a special partnership, students at ICC who have received an Associate in Arts, Associate in Science, or Associate in Engineering Science degrees and are preparing for baccalaureate completion in Bradley University programs, will be guaranteed admission if they have a 2.5+ cumulative GPA. Bradley and ICC have also created more than 40 2+2 agreements all to ease the transfer process for students. The 2+2 agreements map out what courses are needed in the first two years at ICC and what a student is expected to complete in the next two years at Bradley to graduate in 4 years. Dr. Walter Zakahi, Provost and Senior Vice President of Academic Affairs at Bradley says this is the right time for these agreements. “Now more than ever our institutions need to be working together to ensure students’ success and to help meet the local workforce demands.” Bradley University offers two full-tuition scholarships to ICC graduates entering Bradley each year, the Perley and Thomas scholarships (named after ICC presidents Drs. Leon “Bud” Perley and Thomas K. Thomas).